Philosopher of the thirteenth and fourteenth centuries. He was the author of a philosophical commentary on the Pentateuch, written about 1306, when the struggle between the Orthodox and the friends of philosophy was at its height. This, however, did not prevent Nissim from giving rationalistic explanations of the miracles and of the Bibical narrations. Thus he explains that the destruction of Sodom and Gomorrah was due to a volcanic eruption, like that which in 1302 had devastated the island of Ischia. 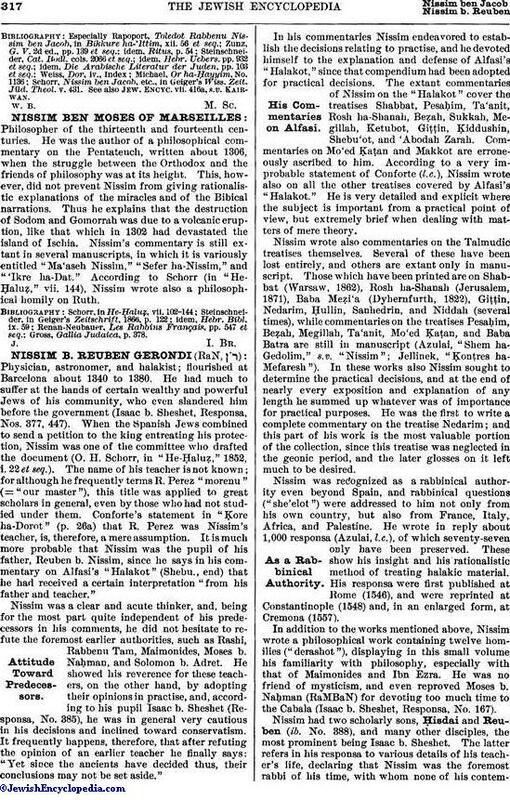 Nissim's commentary is still extant in several manuscripts, in which it is variously entitled "Ma'aseh Nissim," "Sefer ha-Nissim," and "'Ikre ha-Dat." According to Schorr (in "He-Ḥaluẓ," vii. 144), Nissim wrote also a philosophical homily on Ruth. Gross, Gallia Judaica, p. 378.